With Banded Gastric Sleeve surgery..your stomach will never be stretched any more! What is Banded Gastric Sleeve surgery? Banded Gastric Sleeve surgery..is the most updated bariatric surgery worldwide, where a band is inserted in the surgery around the stomach preventing its expansion and stretching in case of the patient overeating. What is the difference between the Banded Gastric Sleeve and the Gastric sleeve? In the gastric sleeve, about 80% of the stomach is removed and thus reduce the size of the stomach to a great extent, the patient feels full as soon as eating a small amount of food. It is laparoscopic by 4 small surgical openings not exceeding 2 cm in length. As the hunger hormone is removed in the process, the feeling of hunger after the operation is rare. 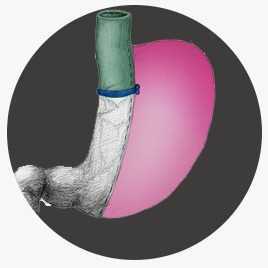 The Banded gastric sleeve is inserting a band around the sleeved stomach to prevent its extension in case of patient overeating. What is after the Banded gastric sleeve surgery? 1-Hospital stay one day after the surgery. 2-Return to work and normal life after a week of surgery at most. 3-commitment to follow up with the doctor and intake of vitamins and nutritional supplements for a period prescribed by the doctor. 4-commitment to eating healthy and practising sports to keep the results of the process. Why choose the Banded gastric sleeve? 1-It is a laparoscopic surgery which means less pain, better cosmetic look and better results. 2-There will be no further stretching or weight regain due to a gastric band inserted into the process. 3-The process achieves impressive results in weight loss. 4-The process can eliminate complications of obesity such as diabetes, hypertension, hypercholesterolemia, respiratory diseases, bones and joints diseases. What is the function of the band that is inserted around the stomach in the process? 1-Prevents the expansion of the stomach and therefore return in weight again if the patient tends to eat over the stomach capacity. 2-Also presses on a certain nerve in the stomach if the patient is an overeater, giving the patient the feeling of satiety so he stops eating. Who is the inventor of the band in the Banded Gastric sleeve surgery? Dr Mathias Foby is a global bariatric surgeon is the one who invented the band in the Banded Gastric sleeve and Dr Ahmed Al Masry met him at the IFSO Conference of the World Bariatric Surgeries Conference held in 2018 in Dubai. They discussed the latest findings in obesity surgeries in the world.